We are ready for breakfasts outside, sunny day luncheons and backyard barbecues, how about you? 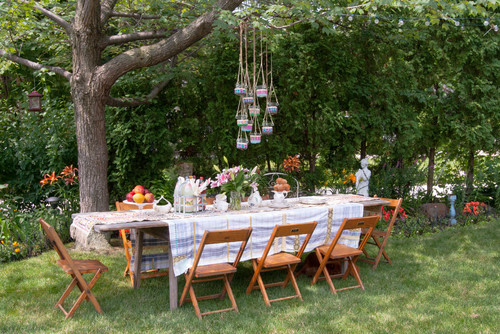 Turn up the charm of your outdoor soirees this summer with some decor tips for creating a stylish and functional environment, whether you’re at a picnic table or at the park on a picnic blanket. Pick fresh flowers from your flower garden or gather wildflowers to put in a vase and use as a centerpiece on your picnic table or outdoor dining table. The more eclectic and unique the vase or planter the better, as it will complement the wildness of the natural flowers and plants inside, and add instant style to your space. Offer them as party favors or gifts for your guests to go home with at the end of the event. Basically what we’re trying to say is go big with color! 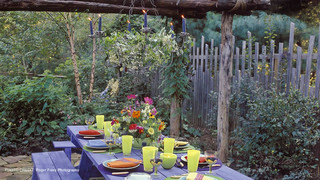 Use bright and bold outdoor flatware, cups or glasses and plates to amp up the fun of your outdoor summer event. You are going to need items to eat and drink with anyway, so they might as well work for you in terms of decorating. You can go a more traditional route with using different hues of the same color, displaying a few statement pieces or mixing and matching colors and patterns. For accent lighting or an added touch, hang paper lanterns or tealight holders from the trees above, or string outdoor lights within your garden for a twinkling touch and added charm. This is also a great way to mark the dining area, so your family and guests will know right where to go for your infamous potato salad and divine grilled chicken. 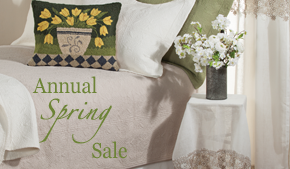 As a tablecloth, runner and even down to your placemats, decorative linens will complete your charming outdoor look. 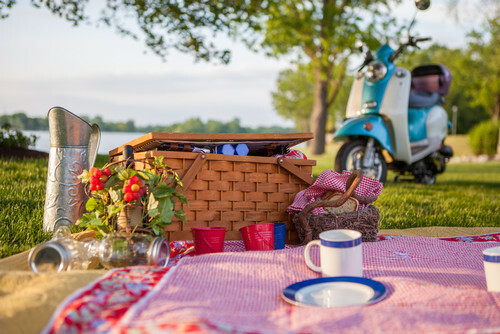 Especially if you’re headed to the park with a picnic basket for the afternoon, an easy-care soft blanket or throw can make the experience all the more sunny. Try layering a runner and tablecloth for shabby chic style you can’t help but admire, and allow the pieces to drape over the sides of a table for a casually comfortable look. This entry was posted on Thursday, May 19th, 2016 at 8:59 am	and is filed under Candles, Decorating, Entertaining Tips, Furniture, Gardening, Outdoor, Pillows, Seasonal Decorating, Seating, Thematic, Thursday's Theme. You can follow any responses to this entry through the RSS 2.0 feed. You can leave a response, or trackback from your own site.